Our last three posts have featured the bouts of severe winter weather that we have experienced lately but, at the same time, our thoughts are turning to Spring and plans for the farm. We know winter is not finished yet but the days are getting longer and yesterday’s weather was positively ‘springlike’ with warm breezes (nearly 10 degrees C) and quite a bit of sunshine. The snow which came above my knees earlier in the week is now only about 6 inches deep and melting rapidly. Chickens. Likely to be the first animals we will get. As soon as I can adapt the summer duck cage for colder weather and get an electric fence set up around the chicken yard, we plan to order about 10 laying hens. That may take some time because the ground needs to thaw enough to drive deep the grounding rods for the electric fence. We know that we have predators, including coyotes, foxes, raccoons, mink and weasels, all of which would love a free chicken dinner, so we don’t want to compromise on the chickens’ protection and want to get the electric fence working well first. 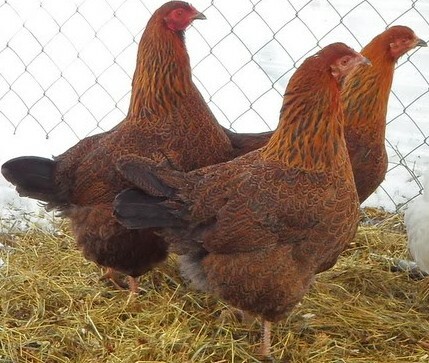 In order to get eggs fairly soon, we plan to order about ten Red Sexlink pullets, (young hens which are just approaching egg laying age)from a local feed store. They are known as a highly productive hybrid, producing a good number of brown eggs. Andrew and Colleen have had some of them in BC and they have done well for them. 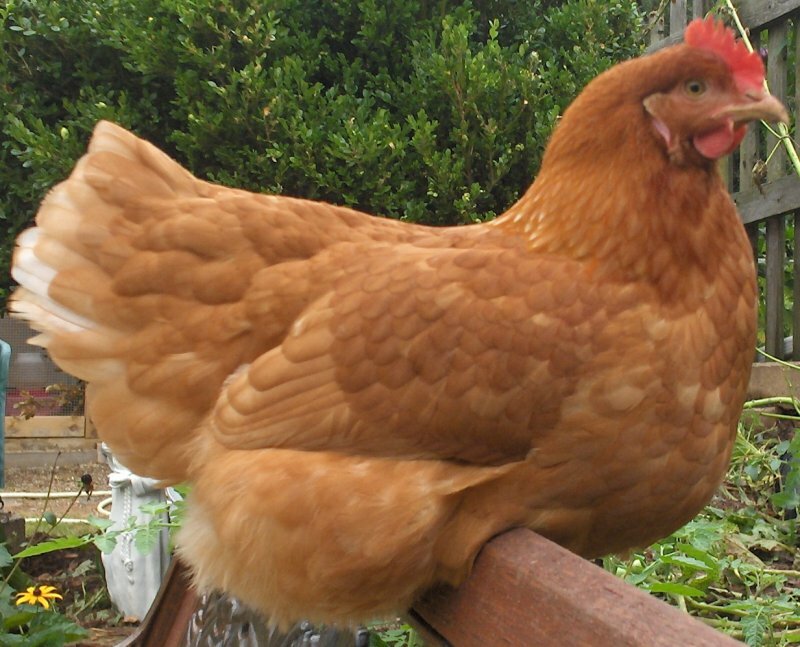 A Red Sexlink hen. A hybrid known for high production of lovely brown eggs. To build a longer-term flock, we have already ordered 20 one day-old Partridge Chantecler chicks which are scheduled to arrive on April 29. That breed was developed nearly a century ago in Quebec and the chickens are known to be self-reliant (i.e., able to forage quite a bit of their own food), cold hardy and good producers of eggs and meat. The order is “straight run” which means that we will get a random mixture of little hens and little roosters. We will need only one or two roosters in order to build a flock so the others will likely become chicken dinner in the late summer. Young Partridge Chantecler chicks. We have ordered 20 of these, scheduled to be ready April 29. 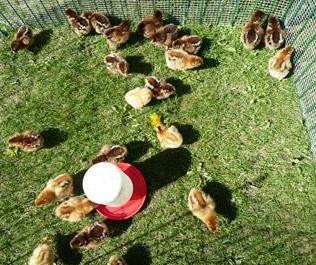 Partridge Chantecler hens. Note how small their comb is. Because combs often freeze in the winter, the breeders selected for small combs that don’t freeze as easily. We hope that when our chicks arrive they will become the foundations of a long-term, productive flock. 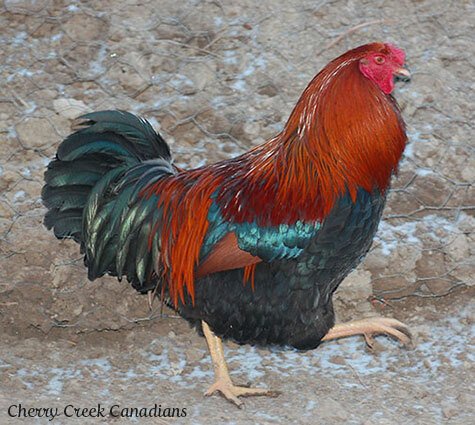 The Partridge Chantecler rooster is much more showy than the hens but we won’t be needing to keep as many of these to build the flock. Sorry guys! Because I am scheduled to be away teaching in Ottawa three times between now and the end of March, we will wait to get any larger animals until April. Sheila is prepared to look after chickens while I am away but is not yet experienced with larger animals. Soon she will have experience with them and, in addition, Andrew and Colleen will be living nearby to provide back up assistance but it is better not to add too much pressure all at once! Pigs. They seem to make a lot of sense in our situation. They can forage quite a bit of their own food from our pastures and wooded areas. The historic Black River Cheese is only three kms away and the production manager told me that he would be happy for us to come and pick up whey, which is a good source of protein for pigs and which they would otherwise just pour down the drain. In addition, pigs thrive on waste from orchards, vegetable gardens, breweries and apple cider plants all of which we have reasonably close by. In addition, they are said to be good workers who, with a little corn as incentive, like to turn composting piles, clear brush and root up stumps. We plan to start by buying weaner pigs rather than raising our own and, as we gain experience, consider getting sows and boars and raising litters. 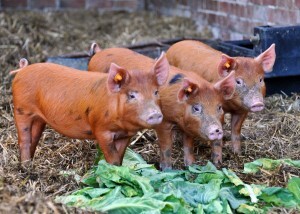 Weaner pigs. Usually between they are between 30 and 60 pound and take 6 or 7 months to reach 250-300 pounds. At that size they are no longer very cute and most people who raise them say that they don’t have much difficulty sending them to the butcher at that stage. .
Goats. Given how much brush and rough pasture we have, goats also seem to make a lot of sense for us. They prefer the rough stuff over grass and grain and we need their help to clear brush and reduce weeds in fields. We think that the grandchildren will enjoy watching the little goats. 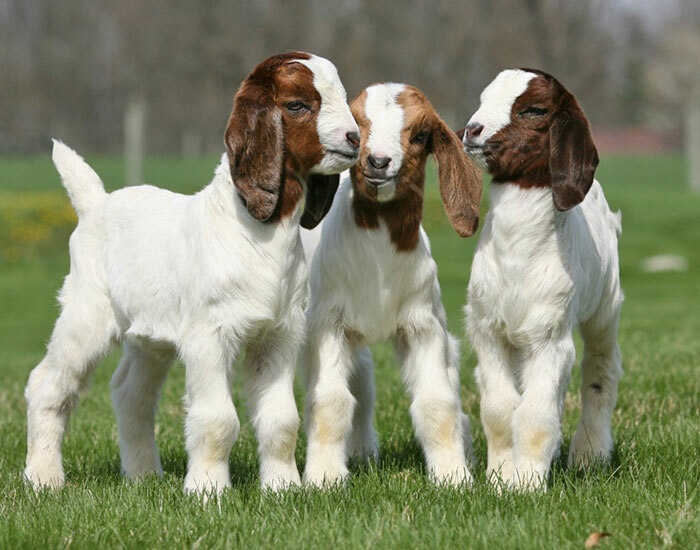 Colleen is potentially interested in milking goats but we are more interested in raising meat goats. We are told that there is a strong demand in the area for goat meat. A couple who are planning to start very close by a food store, featuring local products, told us that they are very interested in buying goat from us. Boer kids. It may be that more than just the grandchildren will find these little guys entertaining! We are working hard on gaining contacts and sources for both pigs and goats and will post updates as we make progress.